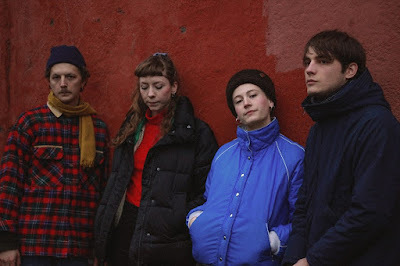 Holy Now are an indie-pop quartet (Julia Olander, Ylva Holmdahl, Samuel von Bahr Jemth, Hampus Eiderström Swahn) from Gothenburg, Sweden and today is the day they are releasing their debut album Think I Need The Light. Indie-pop fans will find the album to be lavish in upbeat, shimmering guitars and drum beats accompanied by Julia Olander's distinctive voice. Inspired by Gothenburg rain, heartbreaks and friendship, the 8-track album feels like looking at the future through cherry blossoms. Think I Need The Light is available on limited edition vinyl and CD via Lazy Octopus Records and on various listening platforms. The album is already among our favourites of the year. Be sure to check it out below!